This article explains how to implement and test SOAP web services with Spring WS project. 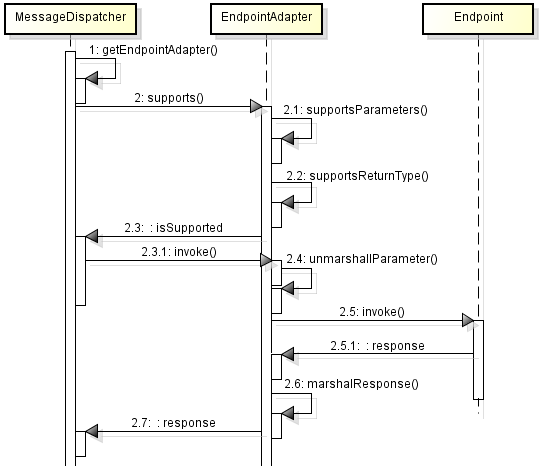 This example uses JAXB2 for (un)marshalling. To develop the service, I’ll use the contract-first approach, which consists in defining the service contract first, and based on this contract implement the service. The example application processes orders. We’ve got a front controller (messageDispatcher servlet) that will handle order requests, invoke the service to process the order and return a result. We can add different validations to these schemas, but in this example I’ll just modify several types like clientId, productId and confirmationId (xs:string) and orderDate (xs:date). The mapping of XML data types to Java types is done by JAXB. You can check which are the mappings provided at Oracle JavaEE tutorial. The last step would consist in writing the contract, generally expressed as a WSDL file. If you don’t want to create it by hand, the Spring-ws project provides us with a way to generate this file from an XSD schema. We will use this second approach as you will see in the configuring the application section. This task will create Java classes in the xpadro.spring.ws.types package (you may need to refresh the project). @Endpoint: Registers the class as a component. In this way, the class will be detected by component scan. @PayloadRoot: Registers the endpoint method as a handler for a request. This annotation will define what type of request message can be handled by the method. In our example, it will receive messages where its payload root element has the same namespace as defined in the XSD schema we created, and its local name is the one defined for the request (clientDataRequest). @RequestPayload: Indicates the payload of the request message to be passed as a parameter to the method. @ResponsePayload, indicates that the return value is used as the payload of the response message. This configuration contains web service infrastructure beans. To facilitate the client to access the web service, Spring provides us with the WebServiceTemplate class. This class contains methods for sending and receiving messages and it also uses converters to (un)marshal objects. Just remember to start the server with the deployed web service application before executing this test. If you just want to implement a web service, the article finished in the previous section. For those curious about how this really works, I will try to explain how a request is mapped to the endpoint, just a little more low-level than explained until this point. It asks the EndpointMapping which is the appropriate endpoint. With the information received from the mapping it uses an endpoint adapter to invoke the endpoint. The adapter also support argument resolvers and return type handlers. 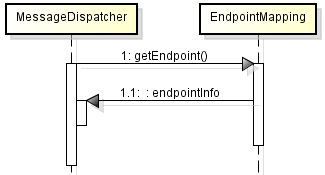 MessageDispatcher contains a list of endpoint mappings, each of them, containing a map of previously registered method endpoints. In our case, the JAXB mapping PayloadRootAnnotationMethodEndpointMapping has registered all methods annotated with @PayloadRoot. If the qualified name of the payload of the message resolves as a registered method, it will be returned to the MessageDispatcher. If we didn’t annotate our method it would fail to process the request. If an adapter is returned, it will then invoke the endpoint, unmarshalling the parameter before passing it to the method. When the method returns a response, the adapter will marshal it. We’ve seen an introduction on how to implement a simple web service and then test it. If you are interested, you can also take a look at how to test the client-side with MockWebServiceServer. hi, do you have an example that uses spring annotation and not web.xml or can I anyone point me in the right direction to get this. Also, I cant find the link to the source code. Kindly re-share. Hi, the link to the source code is in the second section of this post. What does the test-server-config.xml file contain? Can you please help?